A price charged by the dominant producer that becomes the price adopted by all the other producers. A situation in which a company sets a price for a product and this company's market share and/or brand loyalty is so strong that other companies are compelled to match or beat the price. The company that first changes the price is said to show price leadership. a situation where a particular supplier is generally accepted by other suppliers as the ‘lead’ firm in changing market PRICES. Price leadership systems are often seen by suppliers as a useful way of coordinating their price policies so as to limit price competition and avoid ruinous price wars (see OLIGOPOLY). They may, however, act as a cloak for COLLUSION, and as such operate in a way detrimental to the interests of consumers. See MARKET CONDUCT, COMPETITION POLICY. Fig. 150 Price leadership. Price leadership by a low-cost firm. a means of coordinating oligopolistic price behaviour (see OLIGOPOLY), allowing firms whose fortunes are MUTUALLY INTERDEPENDENT to secure high profits. One example of price leadership is that of leadership by a DOMINANT FIRM (a dominant firm-price leader) possessing cost advantages over its competitors. In Fig. 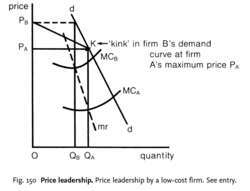 150, firm A is the low-cost supplier, with a MARGINAL COST CURVE MCA; firm B has higher costs, with a marginal cost curve MCB. The individual demand curve of each firm is dd when they set identical prices (that is, it is assumed that total industry sales at each price are divided equally between the two firms); mr is the associated MARGINAL REVENUE curve. Firm A is able to maximize its profits by producing output OQA (where MCA = mr) at a price of OPA. Firm B would like to charge a higher price (OPB), but the best it can do is to ‘accept’ the price set by firm A, although this means less than maximum profit. For given firm B's conjecture about the reactions of firm A to any price change by itself, any alternative course of action would mean even less profit. If it were to charge a higher price than PA, it would lose sales to firm A (whose price is unchanged), moving left along a new ‘kinked’ demand curve segment KPB; if it were to cut its price below PA, this would force firm A to undertake matching price cuts, moving right along the demand-curve segment Kd. Firm B could not hope to win such a ‘PRICE WAR’ because of its higher costs. Thus, firm B's best course of action is to charge the same price as that established by firm A. Although price leadership systems are used by suppliers to avoid ruinous price competition, they may, however, act as a cloak for COLLUSION, leading to higher prices that exploit consumers. See COMPETITION POLICY. Taking over as executive vice president of merchandising at Sam's Club is John Furner, who had been chief merchandising and marketing officer at Walmart China, where he is credited with making key improvements in buying leverage and reducing organizational complexity, yielding improved profitability and price leadership. As a result we have further extended our price leadership, become far more customer-focused, and helped millions of people save money every day. We will continue to strengthen our price leadership around the world. Finnish trading house Kesko Corporation said on Tuesday (11 April) that its subsidiary Kesko Sports would open the first Budget Sport store, with a focus on price leadership, in cooperation with Intersport International Corporation (IIC). In fact, Miller CEO Norman Adami said that Miller is prepared to lose some volume share over the short term in order to support A-B's reassertion of industry price leadership. A hostile takeover of what is widely considered to be a well-managed, large, international packaging player leaves little room for trade buyers to leverage huge synergies from the deal, although there could be an upside on price leadership issues. By definition, strategic agility is achievable only with competitive strength in a combined set of generic capabilities, namely quality, delivery, flexibility, and price leadership. In markets where traditional providers resist the change, it is possible to see years of no change, with managed care options growing slowly but showing only modest price leadership. Price leadership is defined by Scherer and Ross [Industrial Market Structure and Economic Performance, 1990] as when a firm announces the price or price change and other businesses follow. The standard price leadership model focuses on a dominant seller of a homogeneous product who correctly assumes all other sellers to be pricetakers.